That there Christmas break caused disruption all over the shop, not least to our light lunch ligging. Ages since Asda. Thought: if a planned cafe trip was called off, could there be some sort of pools panel to study the menu/ambience/location, then provide a probable verdict? More likely, and I speak from experience, that the gig will go offshore. "They offer a wide selection of hot snacks and drinks. Recommended is the ciabatta brunch, which is your basic English breakfast in some fancy Italian bread. And with a pot of tea thrown in." They're obviously doing something right since it's busy busy inside when the Bicycling Burrito Bros arrive. Lots of footfall here, being on the same latitude as the Ipswich Institute, Berridges, St Lawrence and Pickwicks. Even the more recent extension into the ex-chocolate shop next door is full. Punctual Grenvyle has raised his flag on a downstairs table for three, and we're settling in nicely when in walks Rene, our new best amigo. Rucksacks and drinks grabbed, upstairs we trek for that extra place. Lots of options, quite a few specials too. That all day brunch, still sitting pretty on the menu, lures in G. I can't get past the chilli & chips, which is served in a pair of matching bowls. Most satisfying. Andy's rarebit (with extra bacon) bemuses Rene who can see no trace of Bugs Bunny. Notable is the proper tea, with table-hogging paraphernalia of pot and milk and strainer. 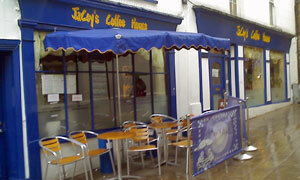 While here, should also mention the associated takeaway offspring, JaCey's 2 Go, opposite the Corn Exchange. Considering the crowds, service is excellent. Shifting tables, paying early, changing orders is hassle free. C&C consumed, gotta fill that pudding shaped gap. My little joke to the waitress about not ordering a whole cake backfires in a good way when a mahoosive family-sized slab of carrot & orange cake turns up, momentarily throwing the room into shadow. That, and the accompanying cafetiere, make me smile inside before waddling out. If it was a car -- Peugeot 807. If they were passing by -- Helen McDermott.